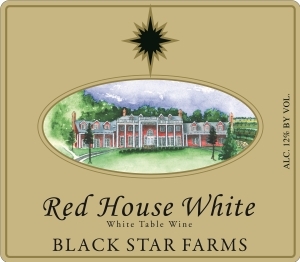 This Red House White is composed of Chardonnay, Riesling, Pinot Gris, and Pinot Blanc grapes gathered from several different vineyard sites on the Old Mission and Leelanau Peninsulas. It is a fruit forward wine with a hint of barrel spice from the Chardonnay that is aged briefly with oak. A fruity, flinty nose accented by a touch of oak combines on the palate to form a well-balanced medium-bodied table wine. This wine has pleasant aromas of the stone fruits apricot and peach, and finishes semi-dry. Drink now or within the next two years. This wine was composed to reflect the variety of the region and is well suited to local cuisine. Savor this wine with whitefish, walleye, perch or freshly caught salmon. It is a great "palate pleaser" that can fit many occasions and pair nicely with everyday dishes. "This wine has a very balanced presentation on the palate and it appeals to dry and semi-dry wine drinkers alike. It is a great everyday white wine to share in good company." From Susan K Smith of Grandville, Michigan on 7/17/2015 . Stumbled upon this at Meijer on sale and purchased to have with grilled white fish and salmon. Fantastic pairing! Great starter wine. Light; ever so slightly sweet with apple notes. Beautifully paired with fish, poultry. Great Summer wine.